Having a family bible is a well known Afrikaner tradition. The household of President Paul Kruger was no different. The family bible of Paul Kruger has had a very interesting history over the last 136 years. Dr. N. A Coetzee has published a number of articles on his successful search for the family bible. A article in the Rapport newspaper of 18 March 2001, shed light on the current whereabouts of the bible and it's recent history. Dr. N. A Coetzee was very well known in historical and cultural circles and he was also member of the North-Transvaal branch of the South African Genealogical Society. The author had the pleasure of meeting the 88 year old Dr. Coetzee in 1999 and having him autograph some of the books he had written. Dr. Coetzee had written a genealogical book about the du Plessis family and wanted to know more about Paul Krugers first wife and their first child who past away with her. Professor D.W Kruger, then retired professor in History at the Potchefstroom University mentioned in his book on Paul Kruger that the all the names of Paul Krugers family had been written in the bible in Paul Kruger’s own hand writing. Hoping that the full names and dates of the child and mother might be written in the bible, Dr. Coetzee started a search that lasted four years. Professor D.W. Kruger mentioned that the bible was last in the possesion of the antique dealers of Israel & Co of Amsterdam Holland. “This book has had a remarkable history. During the Anglo-Boer War it was given to the Magato for safe keeping by Piet Kruger who was then the Field Cornet of his ward. held by Me. Irene Joubert and Mr. Johan Roode. Thus it was saved from destruction because the house and outside buildings at Boekenhoutfontein was damaged by the British and to a large degree destroyed.The strong walls were fortunately capable of with standing even cannon fire. In April 1902 shortly before the peace it was discovered by a British patrol. It was taken to England where it came into the possession of Lord Harmsworth. In 1949 it was bought on an auction at Sotheby’s in London by the book merchants, Israel & Co. of Amsterdam for the sum of £155. Dr. Coetzee then wrote an article on the decendants of Paul Kruger and Gezina du Plessis which appeared in the periodical “Pretoriana No 80” and included a plea to anybody with information regarding the Bible, to come forward. In 1984 the new editor of Pretoriana, Dr. C. de Jong renewed the call in the media for information on the whereabouts of the Bible. The call received extensive coverage in the newspapers, on radio and resulted in Dr. Coetzee making contact with the son of the immigrant who bought the Bible from Israel & Co. and who was in possession of the Bible. In his book, The history of Rustenburg 1840-1940 , Dr. Coetzee included quotes he has written down from the notes in the Bible and also includes a copy of the page written by Paul Kruger of the names of his children. Dr. Coetzee noted that it was a State Bible printed in 1686, Hendrik en Jacob Keur, Amsterdam by Marcus Doornick & Co. and that the size was 45cm x 29cm x 12cm. Given by me at Hermansburg in Natal on the 7 December 1864 to P. Kruger Commandant General of the ZAR living in the district of Rustenburg as a sign of respect from your friend K. Hohls. Superintendent of the Hermansburg Missionary in Africa. Various other articles including carpets, pictures etc. were also found there - G.F. de Pledge. The Sherwood Foresters. Commandant Magoto Wyk"
Dr. Coetzee further mentions that the owner of the Bible had requested not to be identified at that stage. On the 18th of March 2001 an article appeared in an Afrikaans, South African Sunday newspaper “Rapport” and was written by Johanna van Eeden. 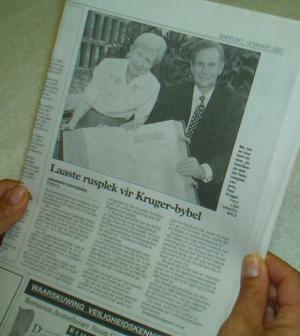 The article was titled the last resting place for the Kruger Bible. It identified the son of the immigrant who brought the Bible back to South Africa as Mr. Jacob Kruidenier. The bible was purchased from him in 1985 by a Dr. A. Shapira and in 1993 it became the property of Dr. Bill Schulenberg. When Dr. Schulenberg passed away in November of 1997 it was inhertited by his daugther Mrs. Irene Joubert. The Bible is now in the possesion of the Roode Family Trust who in 1993, purchase the Kruger House in Clarens, Switerland, where the President passed away on 14 July 1904. Mr. Johan Roode mentions in the article that it is the intention to place the Bible in the President's room as the Bible's last resting place. and my daugther Anna Johanna Mariia Aletta was born in the year 1857 on the 17th March. and my son Stevanus Johannes Paulus was born in the year 1861 on the 23st July. and our twins Dauw Gerdbrant and Niecolaas Jakobus were born in the year 1862 on the 11th June. and my son Tjaart Andries Petrus was born in the year 1873 on the 9th October. Paul Kruger does not however mention his first wife and child. is gebooren in het Jaar 1857 den 17 maart. Zijn is geboren in het Jaar 1862 den 11 Junij.